The GestureXtreme virtual realityVR gaming system is designed withthe point at which entertainment, recreation, fitness, socialization and education meetin mind. Users of all ages and abilities can immerse themselves in different virtual worlds and interact with their surroundings in a variety of achievement-based, gesture-controlled, action-oriented games and activities. Powered by patented VR video gesture-controlled software and the latest in body tracking and immersive technology, GestureXtreme places a player’s real-time, real-time, full-body video video image into exciting computer generatedvirtual environments. 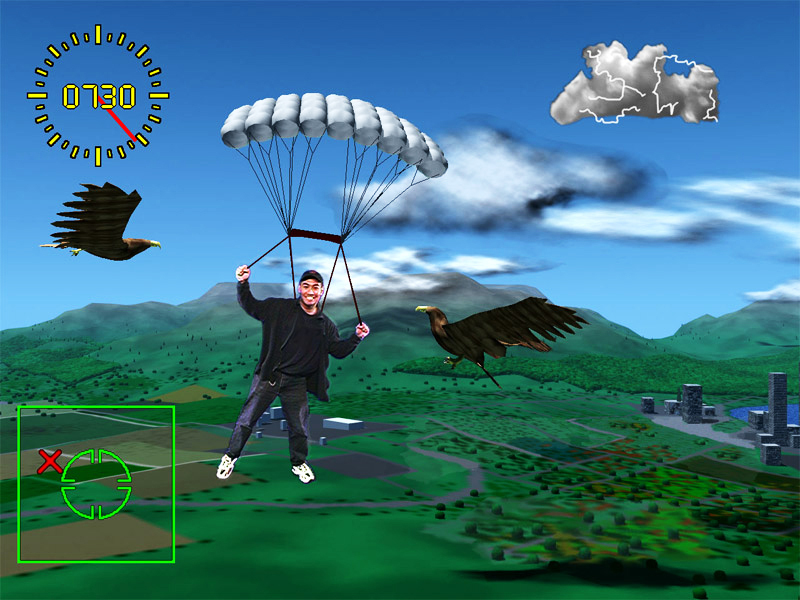 More than20 different games allow let patients to fly, surf, play basketball, play and soccer or simply travel through 3D environments, while interacting with onscreen characters and objects. The user’s body motion controls the program, so there’s no need to wear, hold or touch anythingthere’s no need to wear, hold, or touch anything. special. This makes it afor a hygienic,highly engaging, and interactive experience. Whether it’s a themed adventure or a futuristic showdown, your body is the tool that navigates and interacts with the virtual world. Interactive exhbits offer the kind of full-impact experience that is simply not availible through any other medium. Learn and have fun at the same time. The GX System offers the excitement and challenge of your favourite sport without ever having have to set foot on a playing surface. In this multi-level adventure, you have to collect wizard rings while overcoming malevolent bats and dragons that try to steal your power and keep you from completing your quest. The snowy owls help by bringing you more rings. CREATIVE PAINTING WITH NO MESS! Choosing from an array of colored paint balls on the side of the screen, users can paint freely on the virtual canvas, as the paintball sticks to their hand. Combine paint balls and paint with multiple colors at the same time. This fun game allows you to march to the beat of your own drums! Watch yourself as you compose a new beat with our animated drum set. 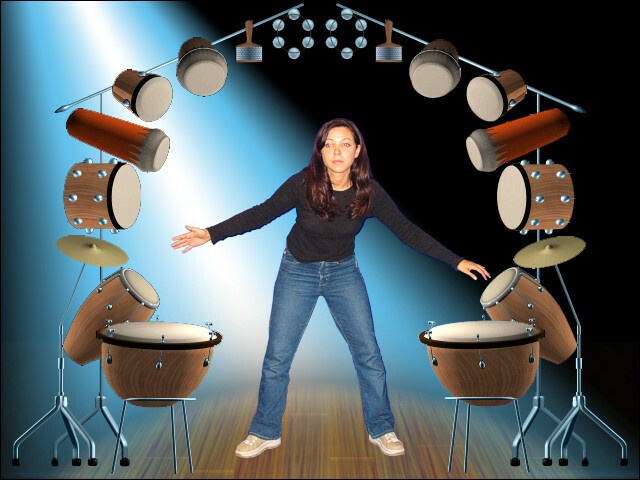 Reach above your head or down by your knees to 'hit' the drums and make incredible music. JUMPING OUT OF A PLANE JUST GOT EASIER! Take a confident 'leap of faith' as you see your image jump from an airplane soaring high above the ground. Control your descent with body language that helps you avoid passing thunderclouds and flocks of birds, as your landing target approaches. Watch the altimeter and blinking radar locator to keep yourself on track. To complete a successful jump you must be willing to use your whole body to land on target. Back on solid ground, are you are ready to take the challenge again? As colored orbs float past your image on the screen, use your lightest magician's touch to make beautiful things happen. With a single gentle touch, the bright spheres undergo a metamorphosis into birds of a brilliant hue. Once the change has occurred, the birdseither take to wing and fly away, or you can easily touch them again to magically change them back into orbs and gain extra points! 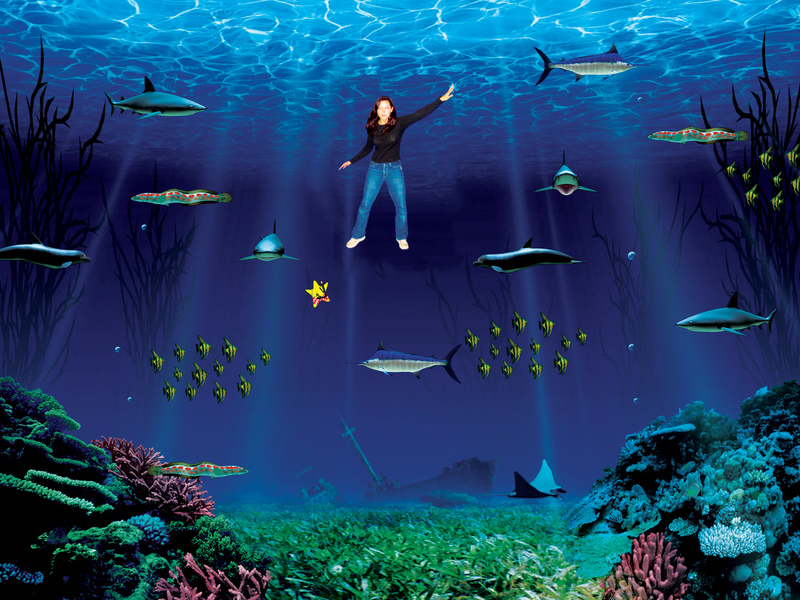 This underwater treasure hunt allows you to swim with dolphins while avoiding electric eels and great white sharks. You have been given unlimited access to an ocean area where lost treasure is located - but you have only a short time to collect it! Grab the floating stars by "touching" them to earn points; the dolphins are your friends and will give you a star if you pat them gently on the nose. Being "eaten" by the sharks, or shocked by the eels causes you to lose precious points, so be careful as you navigate your way through the infested waters! Gather your own sea treasure, and if you collect enough points your digital picture is taken for theSharkBait Treasure Hunter's Wall of Fame! CONTROL A KALEIDOSCOPE OF COLORS! Full Body FX (Color Trip) is an artistic paint program created with our large-screen canvas. Use your entire body; wave your hands, turn your body and the colors fill the screen. Your own tinted image is the center of your masterpiece. You’re a hungry owl or eagle on the hunt for your lunch! 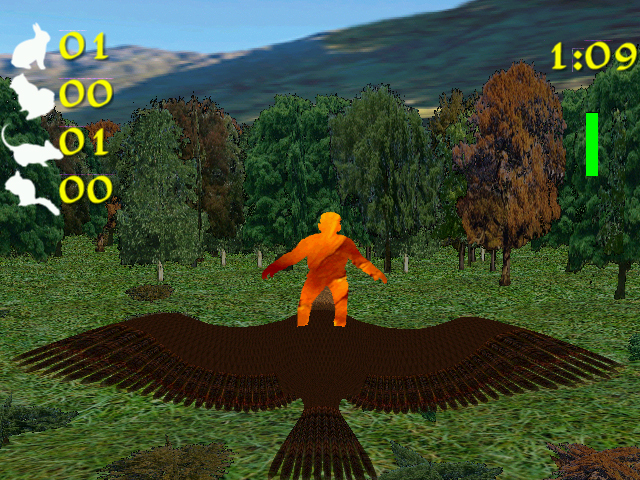 Feel what it’s like to be a predator as you duck, swerve, swoop and pounce as you stalk four different kinds of prey. Race against the clock as you try to catch as many animals as you can. WHITEWATER ACTION WITHOUT THE RISK OF INJURY! A fun filled kayaking simulation challenge. Choose from three levels of expertise and pilot your kayak through three different courses. Lean left and right to avoid objects protruding from the water as you race the clock to make the top ten list! Learn about various butterflies as you try to catch them on screen. Play like the pros! Shut Out allows "arm-chair goalies" to step right into the action to become the hockey goaltender, defending the net against high-scoring snipers in pass-and-shoot scenarios. Use your entire body to block shots, but keep your eyes on your opponents to try and determine if they intend to pass, or shoot! 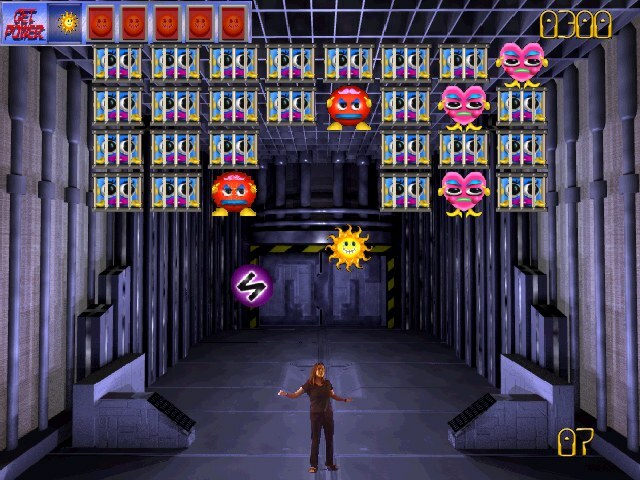 In a nuclear reactor simulation, you are positioned at the bottom of the screen where you must use your body to ricochet a Neutron into the layers of Atoms at the top of the screen. As the experience progresses and more power is released, the Neutron begins to ricochet more quickly, forcing you to move faster in order to harvest the energy. A fun and exciting way to learn some basic principles of Nuclear Physics! The new Virtual Hoops Jam features one on one challenges against actual footage of four of today's top basketball stars - NBA star Jason Kidd, Olympic athlete and WNBA star Dawn Staley, WNBA star Tamika Catchings, and NVAA shooting guard Casey Jocabsen. Visitors to the National Museum of the Filipino People have the chance to visit various regions of the country and try out the traditional musical instruments of those areas. 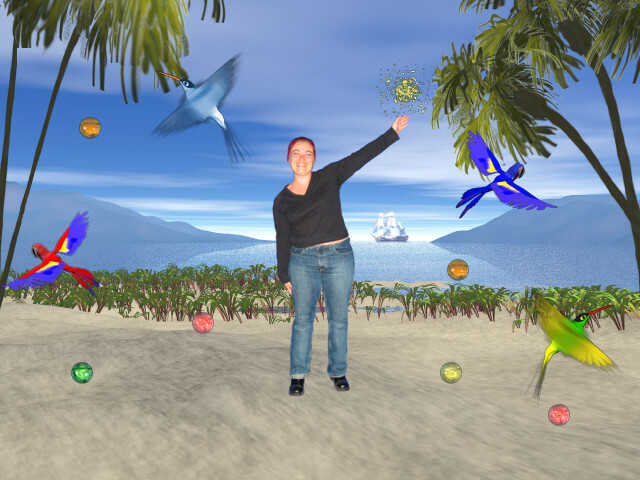 Patrons have an opportunity to experiment with virtual gongs, drums, and traditional string instruments while learning something about the regions where they originated. Notably, the real instruments are much too fragile to permit visitor handling, therefore the only way they can be heard and played again and again is through the use of our Mandala® GX interface. This interactive exhibit allows groups of school children to have the chance to interact and learn about the importance of recycling, and how to go about separating different types of recyclable material. The game educates participants on 'recyclable materials' versus 'non-recyclable materials', then as the participant grows more confident they may choose a more difficult level, attempting to separate a greater variety of recyclable materials. The students must attempt to deposit the materials in their respective recycle bins, racing against the time clock to accumulate as many recycle points as possible. If the participant has obtained enough points, a digital photo is taken during game play and displayed in the "Recycling Hall of Champions" which is shown between games. This journey begins in a lake where heat evaporates a tiny water particle into the air. You ride the water particle into the clouds, where you attempt to combine with other water particles to form a water droplet big enough to fall from the sky. When you fall, you land on the ground, seeping into an underground stream and attempt to navigate your way through the stream past water taps, clogged sections, and other blockages. If you make it through the underground "maze", the stream rejoins the lake completing the water cycle. Visitors learn about the various stages and states of water as it journeys through the environment. The net is big and your opponents are quick, so as the virtual goal keeper you must be on top of your game. You see yourself in the crease, defending the net - use your entire body to block a barrage of shots from your off-screen opponents. A fun and exciting way to test your goal keeping skills! Who is the best goalkeeper? You, or your friends? ZERO-GRAVITY FUN FOR THE WHOLE FAMILY! A new and futuristic sport simulator set in a weightless environment. Single player action takes place against Spike, GestureTek's animated robotic sports pro - or bring a friend to provide the competition, and see who the superior GravBall player really is! COMPETE FOR THE CHECKERED FLAG! This one-of-a-kind racing game allows you to see yourself in the driver's seat of a high-powered race car! Use your head as the "joystick" to steer your hi-tech vehicle around hair-pin corners and competing cars as you race for the checkered flag. THE BEST OF THE BEACH IN VIRTUAL VOLLEYBALL! 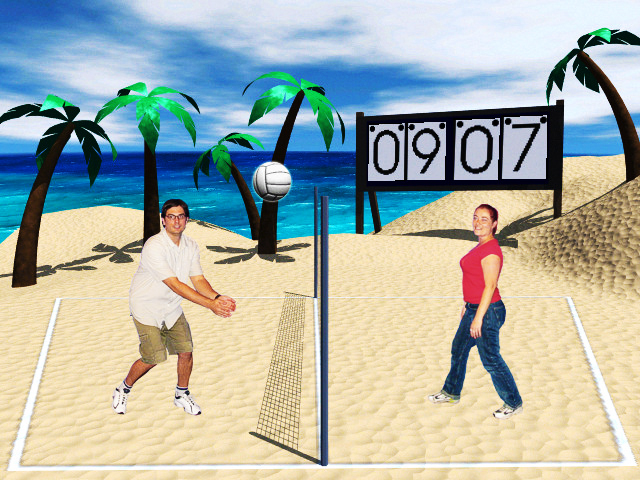 Virtual Volleyball puts your live interactive video image on the sandy court for a seaside match against GestureTek's virtuoso of volleyball, Spike. Bump, set, and spike your way to victory, but don't hit the ball too hard, or you'll side-out! There's sun and sand to spare, but don't let the laid-back atmosphere lead you to underestimate your opponent; Spike is one talented robot, and he's had plenty of experience with his beach game! A single participant is matched against Spike, or bring a friend to be your opponent in this one or two player virtual sport title. TAKE ON HIGH-SCORING HOCKEY SNIPERS!